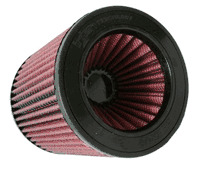 Is it time to replace your Injen Air Filter? Injen Cleanable Performance Air Filters are made of top quality materials and are built to last. Avalable in numerous sizes, Injen has a filter for you, even if you don't have one of their industry leading intakes on your car! If you already have an Injen intake, and you know which filter you need, you can simply select an Injen replacement air filter from the list below. If you are not sure which Injen filter you need, click on the app guide tab above to determine which Injen Replacement Filter you need.